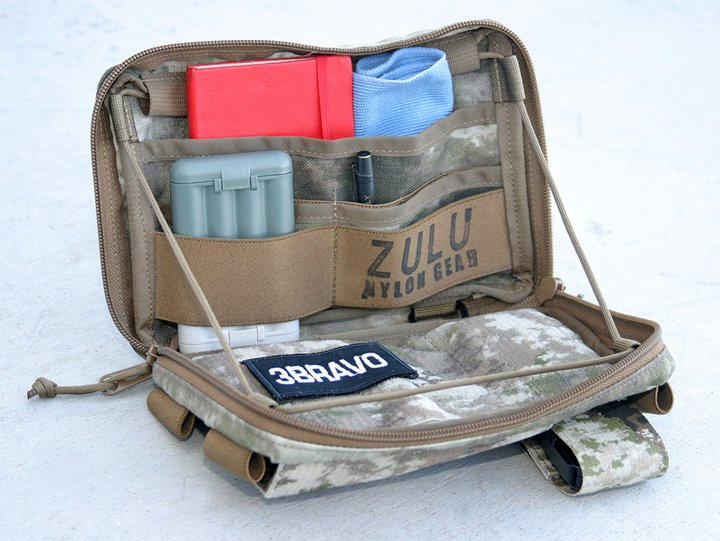 Zulu Nylon Gear Mega Admin Pouch (Custom A-TACS pattern). 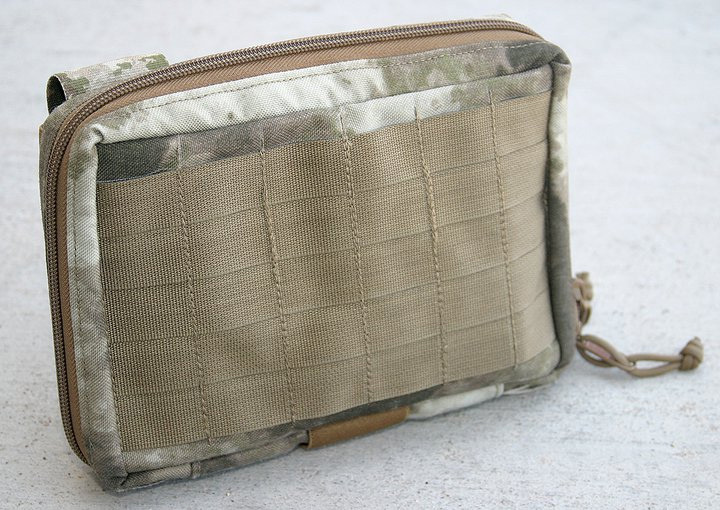 Zulu Nylon Gear's Mega Admin Pouch in custom A-TACS camouflage. Some of the best defense contractors and tactical brands start as cottage industries in someone’s basement. After a few strong designs they grow to larger manufacturers like Triple Aught Design. This seems to be the course for Zulu Nylon Gear. 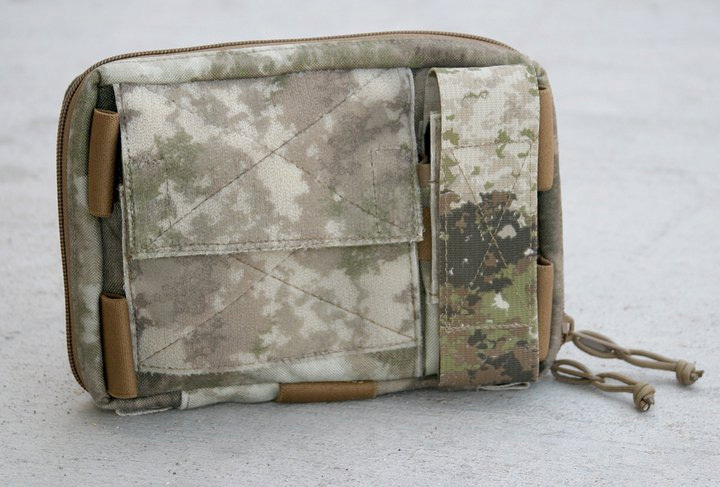 Chicago based Zulu Nylon Gear is an all-U.S. cottage industry tactical supplier with original designs for tactical messenger bags, administrative or “admin” pouches, medical and trauma pouches and magazine pouches among other small items. Everything is made by hand. Because they are small they retain a unique capability for customization. When you interact with Zulu Nylon Gear via phone or e-mail you are talking to the men actually building your equipment. They are open to customization and charge fair prices for good quality work. Admin pouches have become a big tactical sub-category. Because they are small and easy to manufacture nearly every tactical brand has a version. 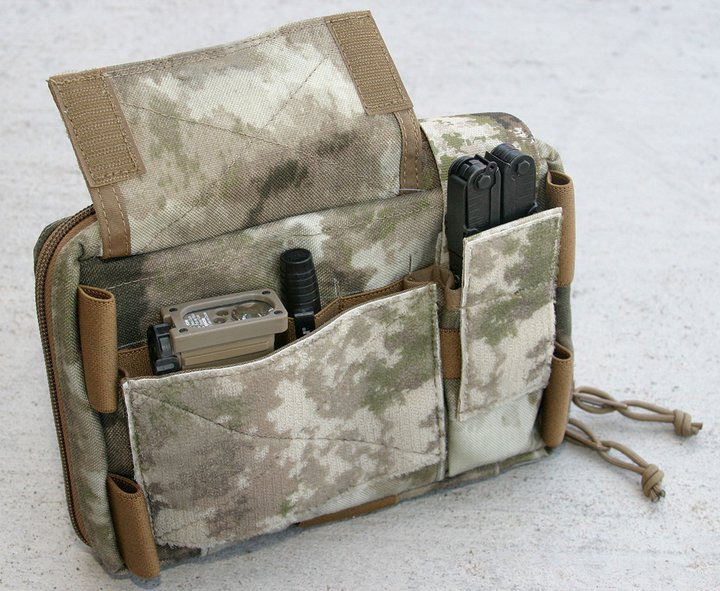 The “Admin pouch” or administrative pouch is intended to mount to a chest rig, plate carrier, backpack or other MOLLE equipped gear where you need organization of readily used items like pens, notebooks, small maps, pencils, a couple spare batteries, penlight, small electronics and a small multitool. A well designed admin pouch enables quick access to frequently used items even in the dark or while moving. I asked Zulu Nylon Gear to build me a custom Mega Admin Pouch from A-TACS patterned fabric to match a large capacity A-TACS Tactical Assault Gear Sentinel Pack I had just acquired. After a couple e-mails exchanged over a day or two they had the project finished in less than four weeks, a good lead time for custom-sewn nylon equipment. This is a big admin pouch. It is 6″ X 5″ and about 1″ deep unloaded. That makes this roughly one-and-a-half times the size of most admin pouches. The Velcro loop is A-TACS patterned on the custom Zulu Nylon Gear Mega Admin pouch. The Zulu Nylon Gear Mega Admin uses extensive storage on the outside of the main pocket. If you organize your load well you won’t have to use the zippered main pocket too often since your frequently used items will be located under the Velcro outer pockets for quicker access. This is an efficient design. 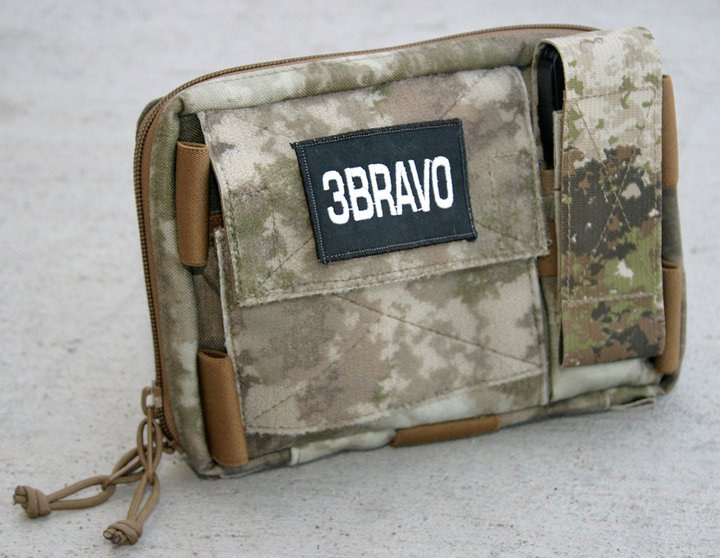 The outside of the pouch is covered with a 6″ X 6″ panel of Velcro loop for attaching patches, IFF, etc. A nice detail on my custom version is the A-TACS patterned Velcro loop is not generic coyote colored Velcro loop but actually A-TACS pattern Velcro loop. A pair of elastic chem-light loops is sewn onto each of the outside edges of the pouch also, a useful detail. The multitool/flashlight/knife pocket is deeper than most multitools are long when folded and the Velcro closure flap is very generous in length. For big tools this is nice but I might have wanted a slightly shorter flap, a small detail. The outer pockets have four elastic “keepers” inside for pens or other long, tall items about the size of a pen like a lens cleaning brush for optics, small tools, etc. On the right of the exterior pocket is a sheath designed for a knife, large multi-tool like the Leatherman M.U.T. or a small flashlight like Surefire or Streamlight. The exterior pocket arrangement is good but the right-hand tool pocket flap seems to be too long for most tools and flashlights I carried in mine. The flap is stretch fabric. I would have preferred it to be about a half to a full inch shorter. The exterior velcro compartments are easy and quick to access for your frequently used items like flashlights and multitools. When you unzip the main compartment on three side of the pouch it hinges open unlike some admin pouches that open only at the top like an envelope. This is good and bad since the top-opening only admin pouches won’t spill their contents as easily if you zip them open in a boat on rough water or in any vehicle moving around a lot. If you are walking in the dark and have to open it quickly you have less chance of losing anything out of a top-opening admin pouch than one that fully unzips. 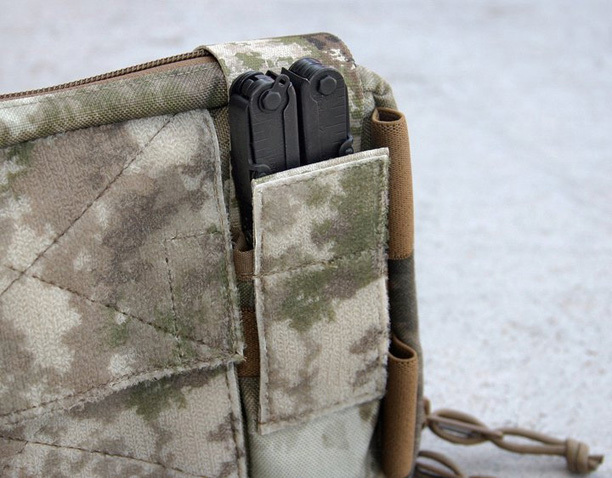 A solution I haven’t seen from any tactical manufacturer yet would be an admin pouch that unzips all the way across the top and only partially down the sides then open like a file folder. The .550 Cord retainer is a great idea for keeping the pouch from opening too far and potentially dropping items. It is adjustable for length. As a solution to the possibility of opening the pouch too far there is a .550 cord retention lanyard threaded through loops to keep the opened flap in place. This adjusts with a spring-loaded cord lock. I like this design since you can adjust how far the pouch will open with the cordlock. There is Velcro loop (in A-TACS on my custom version) on the inside lid to attach a nice, optional clear vinyl map pouch from Zulu Nylon Gear or patches. The main pocket has two deep elastic loop retainers mounted outside two levels of pockets. There is plenty of room for more pens, a small Moleskine or Rite in the Rain notebook, batteries, small electronics and other typical items you need in a hurry. The back of the pouch is covered in PALS/MOLLE webbing and attaches with large size polymer MALICE clips to your vest, rig or pack. Because of the size of this pouch you’ll need four clips to hold the pouch tightly across its width. Full MOLLE webbing across the back of the Mega Admin Panel will use four long MALICE clips to secure the pouch to your gear. Part of the reason I was attracted to the Zulu Nylon Gear Mega Admin was it fit perfectly across the back of the TAG Sentinel Pack. 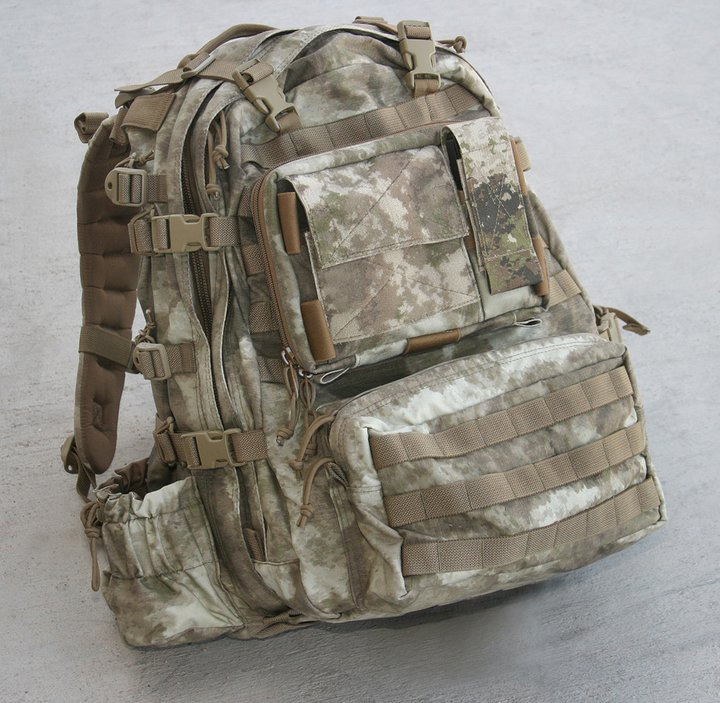 Since the guys at Zulu Nylon Gear told me they would use A-TACS patterned velcro loop on the outside of the Mega Admin it covered the non-A-TACS webbing on the large upper portion of the TAG Sentinel Pack giving it better camouflage and making it look like a more finished package. A part of the A-TACS camouflage concept is that everything should be A-TACS on the operators kit, from boots to weapon to equipment. It doesn’t make sense to use non-A-TACS webbing on an A-TACS pack. Mounted to the back of the TAG Sentinel Pack the Zulu Nylon Gear Mega Admin Pouch covers the non-A-TACS webbing on the top of the pack and provides excellent load organization. Zulu Nylon Gear is a great company to work with. They have excellent custom capability, you talk to the men sewing your gear and its construction surpassed my expectations. They occasionally have unusual fabric for custom work also, including a recent shipment of WWII U.S. Marine “P42” style camouflage used in the Pacific, a distant cousin to the modern AUSCAM. I’m looking forward to their future projects based on the quality of their Mega Admin Pouch. From → Backpacks and Load Carrying Gear. « The Bin Laden Raid Books: Review of the Top 3 Books.